"we are compelled by the quantity of available social and political facts to learn a new visual language for mastering the inner dynamics by the outer" (McLuhan, New Media as Political Forms 2-3). COLLECTIVE CONSCIOUSNESS: Wyndham Lewis wrote that all "living art is the history of the future". The formula is we become what we behold. What our culture compels us to behold is the holographic ICONOSCOPE: all the new media that both virtually surround and contain, as well as permeate our lives, and comprise an intrinsic part of our environment. Debord called it a Society of the Spectacle, emphasizing it's visual nature. Spectacle as a commodity is embodied in so-called Reality TV. The War on Terror is a materialized ideology, fighting an Idea. Ideology is the problem, not the solution to human survival technology. YOU TURN ME I-ON-A: We broadcast our identities as a fusion of recombinant personae, cliches, and archetypes: infinite fractal use of finite iconography: technological self-amplification of our bodyminds. You turn me on; I turn you on in a fusion of knowner and known. I call my broadcast "Radio Free Qabala". coming to you from station IONA, sponsored by the Temple of Living Light. Channels may vary in your locale, that is by your capacity to comprehend my essential nature. Hegel said, “Self-consciousness exists in itself and for itself only insofar as it exists in and for another self-consciousness; that is, it exists only by being recognized and acknowledged.” Arguably, language was the first real technology, and all others mere extensions of our five senses. We are a fractalization of collective history. We are carried forward by the anticipation of our own lives, their emergent qualities. Infinite mirroring and anticipation is beyond synchronicity; Xenochrony is the holomovement of Xenochronicity. Only the level of resolution changes not the content. TECHNOTOPIA: Evolving technology resonates like feedback in our phenomenology. Buckminster Fuller did not view technology as separate from nature and our nature, biological intelligence and tecnological evolution, including speech. Our separateness has created the pursuit of individual "reality wormholes" which reconnect us with collective unconscious, collective identity through "voluntary ESP". We no longer live as point-particles but in our waveforms, often spread simultaneously over several timezones. We can read the entire holographic timelog of the Akashic Records at our local theater or on DVD. KINETIC FIELD OF DREAMS: The Digital Revolution is here and it IS being televised but not on your Grandmother's screen. For artists, the 21st Century is a Digital Universe. Even conventional artists can manipulate their images into a myriad of morphs. Because of insurance problems, fine art has moved toward the giclee print where originals are printed onto canvas and overpainted with a topcoat of paint. But why even bother with the smelly stuff? High end galleries are installing projectors. Popular art is being displayed as virtual paintings on plasma screens in private homes. NEW MEDIA: Media guru Mark Stahlman defines this term he coined as the media which replace the cinesthesia of TELEVISION as the dominant environment in our lives and culture. Surround sound is already the medium that replaced television. Home theaters now dominate the consumer electronics business. They are simply big television sets with multi-channel sound added, replicating the experience of multi-channel sound in movie theaters. Acoustic space as surround sound replaced the "tactility" of television. Media analyst/cultural theorist, Marshall McLuhan stressed that ALL media are ultimately a matter of sensory balances and sensory biases. He believed that artists need to integrate, analyze and utilize rapid changes in technology, in order to truly have a mass impact on people in the modern age. But the electronic environment isn't limited to artists but is available to virtually everyone. No one escapes its influence. Rapid evolution of communication devices enables and future-shocks us at the same time. FIGURE-GROUND SHIFT: Shift happens. New Media are the various implementations and the profound implications of the shift by acoustic space from the ground of our lives under the conditions of the electric media environment (i.e. television). They are becoming the figures of expression in our increasingly post-electric world -- in particular, as reflected in three-channel stereo (3CS.) When you run your own multimedia content through your home theater, it becomes your own Church of Self-Amplification. The post-electronic environment is the ground that is the true medium which creates the message, altering our perceptions of self, others and world. BYTE ME: In 2006, New Media are Broadband, Wireless, High Def, and creating portable environments: the cell phone, high rez digicam, digital video recorder, gaming, podcasting, V-cast. The cell phone has become both the mini computer and TV screen with on demand self-programming of content. Portable screens represent a crucial inflection in the arc of digital media development. McLuhan's famous dictum, "The Medium is the Message" had a second part -- "The Audience is the Content." Entertainment content must become more and more compelling or we simply make our own. We all now have the capacity to capture virtually every nuance of our lives digitally. We don't have to "download" our psyches into the computer; they are already out there in the data streams as disembodied bytes in the aethyr, each with discrete wavelengths: our images, thoughts, and emotions. LUMONICS: High Brow art dominated the artworld before Duchamp, followed by Low Brow postmodern rejection of all metanarratives. Arguably video guru Nam June Paik ushered in Know-Brow art based in electronic media. Only light can capture the nuance of energetic processes. Special FX pushes it imaginatively over the top. The multisensory electronic moving image is now an artist's medium. It can be employed to express representational and abstract imagery through recorded and virtual technologies. The moving image is central to our visual culture, articulating new strategies and forms of image making. The kinetic image fuses electronic and digital media into a new form of expression. We can easily alter both materiality and composition of the electronic image; we can refashion its content, visual vocabulary, and plastic forms. Desk-top cinema has made individual productions a possibility that has jumped the Theatre of the Mind, to become sensuously embodied as a "body without organs", an Android Meme. In the vernacular of paramedia ecologist Bob Dobbs, the parts of the Android Meme are the Chemical Body, the Astral Body, the TV Body, and the Chip Body. PARAMEDIA ECOLOGY: Primal man made his environment by magic rituals that were re-enactments and dramatizations of the creative process by which the world comes into being. Even Renaissance art was trying to capture the values of the past technologically, but 21st Century art is a holographic time machine. Your beliefs determine what century you are inhabiting. Technology has the power to be environmental entirely independent of art as environmental. Even Jung had no idea of the psychic role in creating technologies or in responding and reacting to them. Yet technologies, especially electronic tech, are extensions of the body, making us all Cyborgs. The psychic and social saturation resulting from electric extension of the nerves is much swifter than effects of mere extensions to our physical being, such as clothing, or the wheel, or mirrors. The environmental role of art can be spiritual or concretely physical. The actual effects of new technologies turns old environments into art forms that help define us as modern humans. According to anthropologist Carpenter,we are forced into new modes of communication and forced to create our own environments of declassified information when media render old patterns of perception obsolete. When we program our own psychic and sensory lives, we turn to artists who practice creating their own lives for reference. In many ways we are forced to improvise, taking what is at hand, and forming it into something that could be, into something new, but which is made from the parts of the old in a fractal reiteration. ANTI-MYSTERY SCHOOL: SACRED AND PROFANE. We virtually 'worship' that which we give our attention; the more we give it the more we worship it. Our society is compulsive. Technology as the "demon of progress" is a spiritual rival, a rival to spiritual technologies, our "technical destiny". Naturally in the electric age this rivalry for the soul of man is far more intense than ever before: inner vs. outer quest. Today's 21st Century Media Mystery Schools retrain our perceptions even reviewing obsolete Reality Tunneling of the past: ritualized utility and understanding without boundaries or satcom interconnectedness. Technology competes for and effects human senses and perceptions. Art is inherently and seamlessly wed to media ecology. In some sense, the environment can be seen as merely a war between good and bad art. The question becomes not what do we believe and have faith in, but how can we live more artfully and heartfully, developing human survival technologies that feed our souls and spirits. DIGITAL CONTENT: The interface of computer science and physics has led to the concept that information may be as fundamental as matter and energy. Some believe that information is just one of many forms of matter and energy, which is embodied in things like a computer's electrons and a brain's neural firings. Others suggest information should be part of the new scientific triad--matter/energy/information--the main ingredients of reality. Ed Fredkin goes one step further, with his notion of "digital physics." In this, and other systems, information is more fundamental than matter and energy. He believes that atoms, electrons, and quarks are ultimately binary bits of information. These discrete bits of information may be compared to the quantization of energy in light (photons). The work of Nobel laureate, T.D. Lee suggests that time may also be discrete. Discrete states are the essence of the digital nature of computer operation. Discreteness depends ultimately on quantum mechanics. A general state which 'spreads' is a superposition of such discrete states. Fredkin suggests that the universe may be a vast computer which creates reality through ceaseless repetition--taking information it has just transformed and transforming it further to generate pervasive complexity. Space and time are discrete, the laws of the universe are algorithmic, and the universe works according to the same principles as a computer. According to Fredkin, not everything is best viewed as information, but it helps us model reality and create programs to test our notions. What he is saying is that "at the most basic level of complexity an information process runs what we think of as physics. At the much higher level of complexity life, DNA--the biochemical functions--are controlled by a digital information process. Then, at another level, our thought processes are basically information processing." "But for the practicing artist . . . works of art are not made from ideas or doctrines but, like ourselves, must come into existence by a process which is indifferent to the winds of doctrine. Yet if the artistic process must always be the same the conditions of art and the artist are always changing (McLuhan, "Coleridge as Artist," in The Interior Landscape, 118-19). Qabalah is the ART of being fully human. It is a tecnology for the embodiment of spirituality. The paths of the Tree of Life exemplify templates for all ways of being and becoming. VIRTUAL QABALAH is a first of its kind animated multimedia guided tour of the initiatory mindscapes of Tarot and Qabalah. Much like science, deep mysticism goes beyond beliefs to present direct experience. The whole system incorporates not only the brain and body, but most importantly the outside world too. This view is esentially circular and dynamic, not linear and fixed. Consciousness is access to a sensorium and/or informational input. We are modified by both incoming and self-generated sensory data...a cosmic feedback device. FUTURE HERITAGE: The Qabalistic worldview is a dynamic system, a Whole which differentates itself into parts which then integate back into resonant wholes. The Tree is a general pattern of activity in an endlessly flowing substrate. It's a process, not a thing. Using visionary art and pathworking symbolism, the viewer witnesses the Qabalistic Creation story: emanation of the Spheres of the Tree of Life. Next, through a series of multisensory guided visualizations, he or she finds personal meaning by ldquo;climbing” the Tree, in an exaltation of soul and spirit. HIGH TECH HYPNOSIS: Using congruent yet amorphous imagery at some points provides generic metaphors of transformation as templates or blank canvas for the subjective projections of each viewer, allowing them to identify with the generic aspirant in a personalistic, yet undefined, way. Ultimately, it is our sense organs which help us interpret the world and our experience through our perceptions. They help us make a distinction between what is "real" and "unreal." The emotional part of the brain, (the right, spatial lobe), cannot analytically distinguish a symbol from a symbolic representation. CONNECTING TO SOURCE: In imagination or virtual reality it becomes a moot point. Fantasy, in fact, animates both our inner and outer worlds, and creates meaning. The on-going imaginative process of the psyche is the ground of being. Jung spoke of the psychoid aspect of psyche as the vast non-human action of the universal forces. Aesthetic flow and harmony appeals to the emotional brain, while systematic orderliness appeals to the cognitive nature, creating holistic congruence in the viewing experience. PSYCHOTRONICS: This video DOES things to you: it resonates with and awakens deep layers of the psyche, “rototills” your subconscious mind in an organic way, planting the seeds of transformation, Cosmosis. Self-Regulation is the antidote to Corporate and Political Mind Control. The main criterion of classification is to divide the works in three periods: 1). '1956-1958: The Pioneers, when artists and visual experimenters began writing the first aesthetic computer programs; video installation experiments; 2). '1986 - 1996 The Paintbox era', when the emphasis wasn't on computer programming anymore but on the use of paint programs, together with the first scanners; 3). '1996 - 2006 The Multimedia era', with Internet and interactivity imposing new models of relationship between the artist and his audience. The beginnings of digital fine art are hard to pinpoint because they consist of many convergent threads, which wove together in different ways at different times. Thus, we have the development of the computer in the 1950s through the home PC in the ‘80s and Internet in the ‘90s. Computer generated art is somewhat different from using a computer to render artistic vision. Fractal art opened up a whole new world of aesthetics, an unseen world of mathematical beauty. But fine artists also began using the computer as their medium. Then there is the thread of film and video, which converged, in digital video effects (FX) or CGI. The field of media studies was highly influential philosophically, etc. Media oracle, Marshall McLuhan became a pop culture figure in the 1960's with his seminal works, Understanding Media: The Extensions of Man (McGraw-Hill, 1964) and The Medium is the Massage: An Inventory of Effects (with designer Quentin Fiore, Random House, 1967). Most of MM’s quotes used here to make our arguments are from these works, though some points were later attacked by Postmodern critics. Polymath, Wyndham Lewis and McLuhan were close friends in the 40s and 50s. Lewis published America and Cosmic Man in 1948 (Britain) and 1949 (US). Lewis’s book on the United States as prototype Cosmopolis greatly influenced that pioneer exponent of electronic globalism, McLuhan, inspiring his famous phrase "Global Village". Lewis was a novelist, critic, philosopher, poet, sociologist, travel writer, autobiographer and, far from least, painter with galvanizing styles all his own. ''An explosive force'' is what Lewis required the artist to be. Some of the chief artists of that time, including Lewis, Yeats, Eliot, Pound, Joyce, were among the first to probe and define the esoteric dimensions of media. These artists teach us to distinguish figure from ground and so allow a consciousness of the surround (ground), which shapes us. This new consciousness is a path to freedom from control by the new surround.McLuhan indicates that the advertiser is like the artist in wanting to get his effectacross (“McLuhan: What If He Was Right?”). Both are less concerned with what their audience thinks than with theories or with changes of mind, interested in shaping sensibility, in molding the individual's manner of experiencing the world. The advertiser is the artist of the “Electranascence,” having learned his techniques from the more “traditional” artists. Marshall McLuhan's central theory of the mass media as a global extension of the human nervous system is developed from Lewis's stated and published enthusiasm for and belief in the unifying role of mass communications, and their role in rendering the solitary human body obsolete. He echoed R. W. Emerson who wrote that "The human body is the magazine of inventions, the patent-office, where are the models from which every hint was taken. All the tools and engines on earth are only extensions of its limbs and senses" (1870). McLuhan claimed, “Moving from print to electronic media we have given up an eye for an ear." Famous also for coining the phrases "The medium is the message" and “the user is thecontent”, McLuhan’s prescient insight also touched deeply on the nature of creative process and creative freedom in the electronic era. He suggested artists are the cultural antidotes to relentless technological future shock, which simultaneously dominates and emancipates us. For example, artists inoculate us against its effects by introducing technological innovations long before they mainstream and by jolting us out of our commercially programmed trances and mass media social conformities. There is a big difference between being a consumer of the spectacle (Debord) of mass-media or developing content as a digital artist, game designer, or art lab using new media as tools. The software code penetrates cultural and social development. Ownership of information is the real process of control. New media makes different use of established channels and createsextraordinary works that fall outside of any conventional aesthetic definition. It’s a huge, active field with no single aesthetic line.The burgeoning new art culture is independent of the gallery system and infused with the spirit of innovation. Electronica includes digital fine art, software writing, hypermedia, gaming environments, hypertext, novel visualization environments, interactive fiction, distance learning, product design, net art works, information arts, telepresence, browser art, collaborative work environments, active learning simulations, psychophysical feedback, medical applications, virtual reality psychotherapeutics, and digital media arts, whose temporal structures are driven interactively. In each case it is the medium that makes the difference. Media products have a social dimension and varying degrees of immersion and connectivity with the physical environment. If the analysis of the iconic and metaphorical entity of the 'user' is configured as an entity (shaped by the interface) created for the benefit of the IT industry, assumptions of social and cultural control built by the industry itself are deeply shaken. New interpretative paths can be traced which intersect with documented observations and skillfully cross several fields, starting from original perspectives, such as architectural, video and sci-fi experiments. All media are complementary, forged in patterns of interconnection. Opposition between screen and page or canvas is false; both articulate the human drive to particularize and unfold universal patterns. Proclaiming the superiority of one medium over another takes us nowhere, because both are human artifacts, extending different senses. E-media are brimming over, immediate -- glowing wild -- they are whirlpools within vortices, a chaotic media maelstrom, which homogenizes to white noise. All works of art are ‘painted’ against the cultural canvas, the deep background of society. Culture is a set of learned ways of thinking and acting that characterizes a decision-making human group. It determines our paradigms, worldview, values, and aesthetics. Our cultural landscape is morphing and art is morphing with it, and in many cases leading the way with artists as pathfinders. Media is the environment or cultural ground of 21st century life. It is a ground that is at once personal, social, global, corporate, and political. A cross-disciplinary field, media studies uses techniques from psychology, art theory, sociology, information theory, and economics. The development of multimedia and performance art has been greatly influenced by media studies. Media serve as active "metaphors" that have powers to translate experience into new forms, new formats with enhanced flexibility. There is a new spatial grammar for the electronic age, and the digital artist is the pioneer or cybernaut exploring this new media frontier. Chaos engineer Timothy Leary had his own positive take on the cyber-evolution. As usual, he was all for it. “We are mutating into another species - from Aquaria to the Terrarium, and now we’re moving into Cyberia. We are creatures crawling to the center of the cybernetic world. But cybernetics are the stuff of which the world is made. Matter is simply frozen information. The critics of the information age see everything as negative, as if the quantity of information can lead to a loss of meaning. They said the same thing about Gutenberg. Never before has the individual been so empowered. But in the information age you have to get the signals out. Popularization means making it available to the people. Today the role of the philosopher [and the artist, we might add] is to personalize, popularize, and humanize computer ideas so that people can feel comfortable with them. In every generation I’ve been part of a group of people who, like Prometheus, have wrestled with the power in order to hand it back to the individual.” (Chaos and Cyber Culture). Understanding media is to understand the forms of media and to analyze the effects of media -- the content is mainly irrelevant. McLuhan meant the medium has an intrinsic nature and will do what it does regardless of the content conveyed. Certain perceptual systems will be enhanced and others suppressed. New media reverse the relationship between “figure” (a new or conspicuous feature of the environment) and “ground” (the familiar environment). Digital technologies are the new medium; they are the new ground. Technological changes create new environments of perception and the form of media has a more significant effect on society and knowledge than the information in that media. The approach in every study of any medium, once identified, is examining its shape or contours and discovering its underlying meaning. Successive media rise and fall. This holds true in the realm of digital arts - the electronic media. We must remain informed about the subtle nature of new media - the electronic palette -- from which our works emerge. Intrinsic effects make each media unique. The message of any medium or technology is the change of scale or pace or pattern that it introduces into human affairs. "The medium is the message" because it is the "medium that shapes and controls the scale and form of human association and action." Content is the interactive quality, a verb or continuing process. For the digital revolution in art, the computer is one such expressive medium that is transforming culture in a variety of ways, both educational and on the production end - in both ‘input’ and ‘output.’ It has become a virtual Temple of Living Light that is subject, tool, and medium with the aesthetics ofthe database, the algorithm and the code facilitating self-exploration and collaboration. “Art that uses digital technologies as a medium can take so many different forms (ranging from interactive installations and networked installations to software art or purely Web-based art, among others). Even the term Internet art has become a broad umbrella for multiple forms of artistic expression that often overlap. There is art that has been created for and exists within the browser window; there are telepresence, telerobotics, and streaming media projects that establish telematic connections between remote places; there are performance and time-based projects that take place as actions within a specific time frame during which they can be experienced by Web visitors worldwide; there is hypertext that experiments with the possibilities of non-linear narrative; there are netactivism or “hacktivism” projects that use the network and its possibilities of instant distribution and cloning of information as a staging platform for interventions; there are alternative browsers, and there is software art that doesn’t make use of existing applications but is coded from scratch and distributed over the network. In McLuhan’s altered frame of reference, TV broke up the linear thinking of print culture, then “video killed the radio star,” moving us toward electronic culture. Digital artists have led this revolution in art, while most conventional artists have lagged behind this fundamental change in thinking - the subliminal, processed world of electronic technology, which will soon play out in unrestricted space. Multimedia means a convergence of media, communications technologies, art, design, and culture - “intermedia.” Many believe that multimedia is a "new media;" but this is perhaps mis-stated. Many of the elements of multimedia--interactivity, artificial reality, performance, storage, etc. - are well established with their own compelling histories. Technology, communications media, and culture use the history and context of interactive art and design as a framework. In the digital world, film, design, animation, and hypermedia become new media. The historical context for interactivity includes the surreal, fluxus, and situationist movements of the 20th century, as well as the history of artificial reality. New media visions of the future will affect our sense of identity and what constitutes our physical bodies. Perhaps more important than either cliche or archetype is transformation itself, the idea of percept in flux, in a state of change that we used to mean by that now badly abused piece of new-speak, process. The importance of this sense of alteration lies in its compatibility with the Electranascence, the electronic culture of dynamic flow. The significance of percept in flux is seen by paralleling it with the "concept in stasis" which, McLuhan constantly reminds his audience, is an outmoded sensory posture. It is outmoded because it is a direct descendent of that fixed sense of space -- visual, continuous space -- which was bequeathed to the world by Plato and his descendents, and which was intensified for European man in the Renaissance, according to MM in “What If He Was Right?”. Artists are at the forefront of this technological revolution. Whether designing intermedia, computer games, producing web sites, writing software, or working on intelligent systems, artists work on a daily basis consuming and producing electronic cultural artifacts. A collaborative process and model is almost a necessity in new media art. This applies not only to the collaboration between curators and artists but also to collaboration among artists on specific projects. Some pieces require a whole team of programmers, designers, researchers, and et al. al. In other projects, an artist sets certain parameters and collaborators create different (visual) manifestations of the work within these parameters. New media art is more participatory. The work process of the artist who “employs” people to build components etc. is very different from the one required for new media works. In some new media projects, artists become “producers” who work with a whole team of collaborators. In most of these cases, the collaborators aren’t playing the role of contractors but are very much involved in aesthetic decisions. New media art is a very hybrid medium and often demands expertise in very different fields, which one individual alone can hardly acquire. (Paul). “The institution definitely influences my focus but this has a lot to do with the place new media occupies within the art world at this point in time. It is an art form that still hasn’t found an established place in the arts at large. Many people are still scared of computers, technology, and interfaces and do not understand the inherent possibilities of the medium. I could easily curate a show consisting of projects that I find very interesting, and it would turn out to be a complete “geekfest,” entirely inaccessible to a larger art audience. Curating for a museum, I am aware that I’m still introducing many people to this art form, so I strive to strike a certain balance, choosing projects that are accomplished as well as engaging and accessible. Digital technology has had a major impact on the production and experience of art during the past decade and a half. Not only have traditional forms of art such as printing, painting, photography, and sculpture been transformed by digital techniques and media, but entirely new forms such as net art, software art, digital installation, and virtual reality have emerged as recognized practices, collected by major museums, institutions, and private collectors the world over. There is a distinction between work that uses digital technology as a tool to produce traditional forms and work that uses it as a medium to create new types of art. Themes addressed by and raised by the art include viewer interaction, artificial life and intelligence, political and social activism, networks, augmented reality, networked performance, and telepresence, as well as issues such as the collection, presentation, and preservation of digital art, the virtual museum, ownership and copyright. The history of new media in art must include discussions of film making, video, digitally manipulated photography, virtual reality, installation and performance by artists such as Nam June Paik, Laurence Gartel, Vito Acconci, Marina Abramowic, Pipilotti Rist, Bill Viola and others whose seminal works have radically transformed the world of art with border-breaching unruliness. Artists use the computer as subject matter, production tool and artistic medium, sometimes all at once. Cybertechnologies have created new contexts for human interfacing, shaping and understanding culture. Teresa de Lauretis claims, technology "shapes our perception and cognitive processes, mediates our relationships with objects of the material and physical world, and our relationships with our own or other bodies." Like it or not we are now immersed in the dynamic field of computing arts. There are historical, theoretical, aesthetic, conceptual and technical challenges presented by the relatively recent collision of art, culture and computing power. Through envisioning information as popular media, science fiction, computer games, marketing tool, and artist's projects, technology has been and will continue to be a key component of culture rather than just a digital wasteland. Online exhibition means ‘continuous art’; the gallery never closes. Art itself can be a powerful communal stimulant. Does our talk about art and creativity illuminate the subject or confound its dynamic form further? Performance artist, Lauri Anderson says, “Talking about art is like dancing about architecture.” Nevertheless, art is in no danger of being drowned in the volume of discourse that surrounds it. The aesthetic experience is tied to the way we engage certain objects or processes in a unified, intense, complex and pleasurable way. Pleasure is the key to aesthetic value. Desire is its driving force. Any ideas about art remain culture-bound and subjective. Whether we come to it with a romantic or work ethic, art remains a fantastic, seductive, mysterious process, largely for the initiated. But we all value art for what it teaches us about ourselves, others and the world. Whether art is sublime, frightening or pleasing we cannot ignore or deny its immediate impact. Something in the composition, configuration, or setting - implicit or explicit -- is inviting. Ontology is a branch of metaphysics that systematically characterizes reality. The ontology of art seeks to determine what kind of thing an artwork is and provide a means of determining when and where “artworks” occur. Materialists think it is a physical thing (artifact), while Idealists reckon art is a pattern of thought or emotion (aspect), perhaps shared in some way with an audience. No overarching policy can possibly determine what is art among genres, epochs, or cultures. As with food, the pleasure comes in the tasting, not reading the recipe. Art theories proliferate (postmodern, romantic, expressive, emotive, essential, significant), proving that no single notion can encompass its glory. The common properties are only threads of similarity. But we all agree that mankind is artful, and some societies make no distinction with “non-art”, doing everything in the best way that can be done. The philosophy of art explores these issues. Art has its own laws. Issues for the artist include fidelity to one’s self and vision (or in performance to the script, tempo and other dramatic elements), locus of creation, creativity, and the artist’s intention. On the other hand, the artworld is a dynamic social institution with its own agenda, consisting of established practices, historical value, and the exercise of critical judgment, signification, and aesthetic value. Today, an open concept of art is an essential precondition of creativity and novelty in the field. We are either inspired by or wrestle with our media until we discover and realize a form. Form is a process at work - a flux - a gestalt. Creating can refer to a process or a product: composition, innovativeness, novelty, and originality - advancement beyond the current tradition. But creativity is also an essentially self-expressive means of transcending the normal limitations of ordinary life, “possession” by the divine. Frames for art are disappearing as it becomes more and more part of everyday life - the vibrant environment -- not a ‘something’ to be cordoned off in a stuffy museum. Functional art, such as web media, requires no interpretation, just immediate engagement. We don’t simply react, but interact. The process is visceral but somehow “makes sense,” quite literally. It makes the observer a collaborator. Subject matter and content are now ubiquitous. Cyberculture and web life have blurred the distinction in modern culture, as we are immersed in an ocean of imagery and signs. We discover art and beauty at the click of a mouse, and judge by our visceral reactions. The essence of art does not lie in its definition; it is far too complex. Despite differences in technique and media, connecting the fine with the applied arts, we connect the pragmatic and the idyllic. Inspiration can be an exaltation, but elaboration, especially with technical media can be painstaking, reflective, analytical work. “Preparation” during which the creator becomes aware of a problem or difficulty [and] goes through trial-and-error random movement in unsuccessful attempts to resolve a felt conflict. “Incubation”, renunciation o recession, during which the difficulty drops out of consciousness. The attention is totally redirected. “Inspiration” or insight. The “a-ha” phenomenon, characterized by a flood of vivid imagery, an emotional release, a feeling of exultation, adequacy, finality. “Elaboration” or “verification” during which the “idea” is worked out in fully developed detail. Aesthetics is something else. What is artful, beautiful or ugly depends to some extent on taste, or acquired taste (gesture of approval). A work that isn’t necessarily beautiful can be very compelling, such as plasticized human corpses. Aesthetic value is based on reasonable arguments that describe the criteria, credentials or defining features of that value. But pleasure or enthrallment is the key to aesthetic value, in general. “Pleasure” thus becomes a quality of the work, itself. The mind is susceptible to its unique impact, its implicit or explicit beauty. But today we can also find beauty in the flow state of interactivity - the ease with which we navigate an artificial environment and imbibe the information it contains. Like a fine meal, it nourishes us in a way that struggling with technology cannot. An aesthetic experience is a subjective reaction which can momentarily suspend time and consciousness, a sort of transport or fixation - an intuitive contemplation or “ecstatic” state of mind. As human beings, we have an innate craving for ecstasy as much as for novelty-seeking. Suddenly, through apprehension, our mental activity is sparked, rendered unified, intense, complex and pleasurable by the sublime. The “beauty” contest is over. Art is no longer an imitation of life. Postmodern artists reduced the chasm between art and real things to immediate knowledge. Art teaches us about emotions and truths that cannot be discovered or learned in any other way. It stimulates thoughts that cannot be depicted or portrayed. An object’s truth is its being, its emergence. The hyperreal has made the merely real virtually obsolete. Today’s art is challenging, confrontive, transgressive. Short-circuiting our rational minds, it grants us privileged entree into the mystical, the irrational, the nondeterministic. We slide down the rabbit hole, constantly bombarded with it in a pandemonium of nonlinear forms. They feed the older needs of the human mind. In the dynamic model, morphology is a plurality of elements in which what is formed is immediately broken down and re-formed. Growth is a constant interchange of its own elements with the environment, taking-in and giving-out patterns in all directions. There is no hard boundary between ourselves and our surroundings, no before or after in the formative process, in cause and effect, in outward and inward. Interactive art works pose special problems. An interactive art work can only be interpreted through interaction, either as first-person or as bystander. It is obvious that the experience differs between the two positions, whereas one acts and the other watches the acting. The question is whether it is possible to extract the art work from the interaction with it, let alone the (im-)possibility of extracting the interaction among the beholders (first-person and bystanders) of the art work from the interaction with it. Contemporary art is characterized by an increase in the use of technological media, such as videos, television and computers. The human body has also become a site of artistic investigation. It is a challenge to conventional gallery spaces as an exclusive site for artistic display. There is increasing interest in process and procedure as opposed to a finished or static artifact. Context and intentionality are crucial. Design (understood as rational planning) forms an important part of the realization of an interactive artwork. There are many design tasks (often distributed among co-creators or helpers): for example, designing an interface, or a flow-chart for a hypertext architecture. There is also need for engineering skills. However, neither a beautifully designed software code, nor an ingeniously engineered hydraulic platform is a work of art. An artwork requires something else, a kind of surplus of inspiration and signification which will transcend the rational assembly of the "machine parts", melt them together and give them a raison d'etre on a higher level of abstraction. Art is multi-layered and open-ended. There is no final "solution" to an interactive artwork, no way to exhaust its meanings. Modern art is transient, interdisciplinary, multimedial, processual, discursive, dependent on concept and context and besides that increasingly aimed at interactivity with the recipient. Its diversity is in need of documentation in a wider sense, in case it should at some point be subjected to scientific questions and authenticity by those who were not present at its conception and presentation. Interactive art is firmly rooted in the aesthetic upheavals of the 20th century. The questioning of the role of the artist, the work, the audience, the market and the relationship between art and society by the Dadaists, the constructivists, the surrealists and others prepared the ground. In the 1960's Fluxus, happenings and "participation art" (Frank Popper), cybernetic art, the art & technology movement, environmental art and video art already provided many of the ingredients of interactive art. In an artwork which also incorporates an on-line connection the situation gets even more complex: in addition, there is now the possibility of communication with real humans in remote locations as well as with manifold software agents and knowbots residing in the net. Sometimes it will be difficult to tell which is which. In the near future we will probably see more and more of these kind of hybrid artworks, with both a local and a global face, providing the user the simultaneous experience of being present and faraway in some distant location. Such situations tend to reduce rather than increase the narcissistic potential of the medium. We are arguably moving through successive transpositions toward a world where man is art: the locus of art has returned to the immediacy of the body in performance and body art. In interactive art, we become part of the system, part of the dynamic artifact or experience. And, often we are changed tangibly by that interaction. ‘Know Brow’ art is the product of new media - ars electronica -- that transcends the dichotomies of high and low brow. More than “consumable” commercial media, it is digital art that stands the test of time. Know Brow implies the knowledge, attitudes and skill sets necessary to produce art with highly technical processes, but also the visionary capacity to see multiple layers of meaning through direct experience. This knowing uses “knoware” for its discovery process, a seeking, a gnosis that cuts a path through the mindscape of the ‘now’ toward the future that remains perpetually undefined. The future “pulls” these artists forward. Defining the ‘hidden curriculum’ in media schools makes a strong statement about the missing element of art history in technical art education, and the silent blocks in the system to its fulfillment. More traditional institutions have been remiss in honoring the rightful place of digital fine art as the wave of the future. ‘Know brow’ art, as a movement, encourages the active, constructivist acquisition of artistic knowledge and openness to new forms and media, as well as technical capacities. We want to inspire more than digital “factory workers” or proficient craftspeople. We want to enable the student to make, shape or organize with a telos, a meaningful purpose that has deep psychic rootedness: one who invents, not adopts; who shapes not copys; who builds not assembles; who is capable not merely competent; who is efficacious not just efficient; who experiments not just conceptualizes. There is a bliss that comes from within one that energizes the human desire to enact, to enable, to engage, to outwork it, i.e. to transform oneself and the world (bizarre and grandiose as this may sound). Art is a discipline of consciousness, whose ecology is to recycle itself. The Postmodern era ushered in a hodge-podge of styles harking back to bygone eras. Postmodernism began in the 1970's, when the dominant styles of art - Minimalism and Conceptualism - seemed to no longer fit in a world struggling with a myriad of social problems. As a result, a plurality of styles developed. Some Post-modernists forcefully expressed a desire to do away with art that seemed to have no meaningful content, and began to turn back to figurative art and the establishment of meaning. Other Post-modernists attempted to extend modern art in new ways by appropriating earlier styles, which they modified. Due to the sheer variety of sources and styles it is difficult to categorize Post-modern artists with the same ease of earlier styles or movements. The post Postmodern era saw the development of new media, such as digital fine art, digitally modified photography, digital animation, multimedia, holography, computer generated imagery (CGI), interactive gaming, even virtual reality, etc., with styles all their own. Computer enhanced images are produced with a stage of manipulation in digital language using computer software. It can be applied to other media, such as photographs or scans of traditional media, or 3-D objects. This awesome technology is used by photographers, filmmakers, the advertising industry, web designers, graphic designers and increasingly available to fine artists. Suddenly, the entire history of art became fodder for a raw-image-hungry medium that gobbled up, digested, and spat out a pot pourri of historical, fantastic, and futuristic iconography in the digital vernacular. Rapid cut clips are the visual equivalent of ‘sound bites.’ We see the familiar old images Ã¢â‚¬â€œ here a Michelangelo reference, a Van Gogh homage, or a Duchamp pun -- but they have become virtually meaningless in the new contextÃ¢â‚¬Â¦a fractal blur. There is nothing new under the sun, the saying goes. In art, it means there is rarely anything truly innovative, and that most imagery is a rehash of previous work, in which the statement was perhaps more succinctly embodied. Virtually any work can be considered derivative or deconstructed by its critics. The exceptions are works of genius, milestones in the history of art. They foresee the future, hunting it down in the forest of kaleidoscopic potential creations. Revolutionary work marks a transition in a civilization’s worldview. The CybeRevolution marked such a transition. Arguably, today’s marriage of art and science is embodied in new media: digital and electronic arts. Highly technical media have made new images possible through programs that render images virtually as fast as we can think them up. But it requires a lifelong learning curve that is daunting and unrelenting. It requires we continuously update our skill and knowledge base to realize our creative dreams. Experimentation with new compositional programs can yield surprising results moving artists into heretofore-unexplored territories in their work. Still, even new media’s novel appearance can echo the iconography, moods and textures of past eras and their styles. It is the same in fashion where looks and eras are recycled deliberately but interpreted in today’s fabrics and cuts. It all depends on how you accessorize it. Innovation requires more than sampling and restyling. It requires a personal archaeology that means digging up that unique portion of our human depths that wants to come to birth through you - that which comes to be through a conspiracy of necessity and coalescence. One must commit to the image and let it speak for itself in the now, with little or no thought to the past or future. When one opens to the moment, to the process, a flow emerges. Serendipity and synchronicities require fluidity of imagination, an inner eye for what could be important to incorporate, as well as fluency in technical procedures. Style emerges as the result of habitually reiterating creative choices and recycling favored elements. The same ideas roll around over and over, evolving into variations on a theme. Some artists stake their career on this rather uncourageous course instead of evolving further. It may be less a desire to maintain commerciality or please their public than simply lack of fresh inspiration. That inspiration can be rekindled by immersion in new exciting fields of imagery, new mindscapes, new places, new media, great art. Just as our prehistoric ancestors painted their own reflections on the walls of Lascaux, history comes full circle, or as T.S. Elliott wrote in the Four Quartets, "my end is my beginning." THE TRUTH IS OUT THERE: Is It Really? Is the search for the “holy grail” of Truth the ultimate Quest, a journey rather than a goal, as so many philosophers imply? It has taken humanity through the physical rigors of horizontal exploration, and accompanied us on our trips down the rabbit hole of conceptual and spiritual exploration. But, as we know, there is ‘truth’ and ‘Truth’. It is the same drive that motivates both scientist and spiritual seeker to bite off an experiential piece of the Great Unknown..
Is Truth primary or emergent? What is Truth? We may know nothing about truth but presume it knows everything about us. Our concept of truth is actually pretty flimsy. Metaphysical truth is by definition beyond observation, beyond the physically observable, yet perhaps available by deduction or inference. The very first and foundational inner experience in Kabbalah (the art of being fully human) is the Vision of the Mechanics of the Universe, in order to foster a critical eye toward Reality and its underlying physical laws. How can you possibly comprehend yourself if you don’t know the fundamental laws of physics and psychobiology? A common existential “mistake” is viewing ourselves primarily as a solid meatbody, rather than as an electromagnetic wavefront in space that science suggests. If you are wrong about the fundamental truth of your own existence, how distorted will your other notions be? 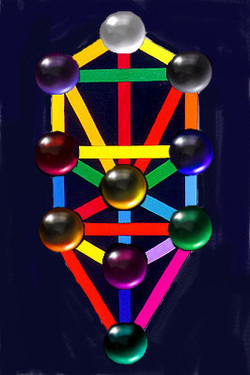 Kabbalah is radically pragmatic, though not objective, empirical, or reductionist in its approach. It invites you to subjectively make the experiment yourself. We should take care that our protocols and resulting theories have a sound rational basis, taking the best from both ancient and modern worlds. The brain can register the same result for a simulated or real event; that is a double-edged sword that leads many to faulty conclusions. Can Truth be extracted from Cosmos; will the Truth ever come out? And if so, where is it hiding? All we know right now about the primary groundstate of human existence is that it is Pure Nothing (vacuum fluctuation; ZPE). Later, we will explore the physical and metaphysical roots of different kinds of Truth, relative and Absolute. They will include physical, emotional, psychological, and spiritual dimensions; scientific and metaphysical truth. We will also explore different domains of truth and how they relate to the Big Picture, adaptation and human survival. Even beautiful and convincing explanations can be wrong. Science often doesn’t know if it is ‘true’ and that is why ‘falsifiability’ is a keystone of the scientific process. We have various forms of truth but they are not reliable for understanding ourselves or Cosmos in the sense of a final and absolute Truth. We try to obtain the most accurate explanation we can at the moment. Still, we cannot say there will never be an absolute Truth. Yet partial truths remain approximations. But this very lack of absoluteness keeps the future open. What most attracts our concern is often at the creative frontier of the mind. Each individual, culture and era reaches backwards in an "archaic revival" to reconnect with the neglected and discadred threads of Truth from the past. Which threads are emphasized depends on what is missing in the present and not yet available from the future. Our understanding and definitions are refined as data are refined and our perceptions become more enlightened. It doesn’t change what is true, but it doesn’t mean we can never comprehend an Absolute Truth that is currently beyond our ability. We can’t really know. But expansion of our previous understanding doesn’t change the reality or truthfulness of existence. In black and white: what exists and true and what does not is false or a lie. Our perceptions can be wrong and sensible. Reality can be strongly counterintuitive or contain hidden options at the point of observation. Truth fits happier with philosophy, but should not be confused with probability, as shown in the nature of paradox. Seemingly obvious truths are often not correct at all. We all harbor unwitting biases that distort the signals received by our senses and generated in our own psychophysical systems. Experiments in sensory deprivation have exposed the intense power of inner-generated imagery/feeling states. We can’t remove this distorting prejudice from our viewpoint so Truth remains elusive, if not completely partial and relative. Defined truths do not help us achieve an absolutely true sense of ourselves or universe. Mathematical and scientific truths come closer in this regard, but even statistical analysis is less than perfect and often not applicable to our unique case, certainly not experientially. Even if we misinterprete it, our experience remains our experience, but we can learn to sniff out our own distortions with critical thinking and reflection. The same is true for the laws of physics which work better for understanding universals than ourselves. Explanations are always being tested and improved, but can never provide perfect, total descriptions. Likewise for facts, data, and evidence which are partial by nature. There is no completely general notion of truth we can define scientifically. But there might be specific absolute truths. But facts do not mean that all truths are relative. A statement is true only if it applies to reality. In science, what was once heresy can become established as a new orthodoxy by further experimentation. But if we stop looking for the improbable, beneath our current beliefs, we will stop discovering deeper truths. Our truths are often the most accurate undestandings we have have in existence. Less accurate explanations often often circulate at the same time and are embraced by some. The joke is the truth will set you free, but first it will piss you off. Plato said poetry was nearer to vital truth than history. Myths were the original explanations and they are still with us, albeit in new forms. We still mythologize about our selves and bodies, about the arc of relationship and what is fair and what we think we deserve, we dream and grieve if we lose that dream. We concoct intellectual myths that we embrace passionately perhaps to counterbalance personal emotional disappointments, and a whole supermarket of spiritual beliefs and technologies with various goals and levels of access to deep reality. They also carry less obvious secondary-gains. Modern myths are the strange attractors of our day causing us to “worship” or reify what the culture admires, mostly notably celebrity. If this essay makes you bristle with objections, realized or unrealized before, and raises only one question that takes you beyond where you presently stand, then my work is done. I only seek to disrupt whatever position you occupy, to perturb, to rototill the fertile soil of your own mind and send you caroming off to your own next real-I-zation. But don’t stop there. I want to plant the seeds of doubt, because therein lies the seed of your future’s fruit, the creativity and individuation that is your unique contribution. I will ask far more questions than I can answer; perhaps yours will be among them. At least I can say I have recounted mine throughout my life, with or without an audience, in my writing and artwork. How can I be disillusioned? Let me count the ways. With my own body, with my own psychophysical emotions and relationships, with my own cherished concepts, ideas, ideals and spiritual beliefs. May I always welcome and learn from it. This search is embodied in the practice of critical thinking, but we know from our experience that sometimes we just have to stand in the Mystery. There are limitations to our understanding, though we like to fill in the blanks for security. We think we have chipped away at pre-scientific explanations that filled the lacuna of the Great Unknown in our earlier history. But is our modern discernment any clearer or more functional in terms of human survival technology? We can’t even accurately remember our own childhoods. Are we not as provincial and superstitious as ever? We bristle at things that go bump in the night. We look expectantly for signs with personal roots and build stories around the meaningful probability shocks of synchronicity, when the environment mirrors our psyches. We rely on astrology more than psychology and anxiously try to divine our futures. How far have we come in 50,000 years? We are fascinated at the prospect of developing or experiencing our paranormal abilities often when we haven’t even developed our conventional talents or made a firm foundation by healing our early wounds. It might be a compensation for feeling powerless in an overwhelming, rapidly changing technological nightmare. We are numb with futureshock, endlessly learning new protocols in the rapidly changing electronic environment. We cleave together in self-validating subcultures where we share compatible warm-fuzzy viewpoints. Our view of nature and the environment is still based largely on only one sense, on sight, and our propensity to believe what we see. Hubble has shown us the galactic nursery at the dawn of time. Mentalists and magicians have exploited this smbiguity between Truth and amazement for centuries to make their illusions convincing. A good contemporary example is Chris Angel, “Mind Phreak”. And yet we “know” that they are tricks, tricks of the sensorium and mind, misdirections which our thinking processes can also play on ourselves. We are probably our own greatest source of misinformation, as expert testimony in court shows. There is no insight, but rather a hollow echoing of our own misperception. Knowing this does not make us immune to bedazzlement. Does the Abyss not continue to stare wryly back at us, frightening us with the prospect of our own mortality, taunting our faith in nature, God or Goddess, and man? Is there ANY truth in us? Can we honestly believe our own propaganda or defend ourselves with philosophical denial? Can we believe we have “grokked” the situation as good as or better than the great minds that have come before us with an “archaic revival”? Can we stand in this existential “no man’s land” and survive emotionally? Has selective, eclectic borrowing of Taoist, Hindu or Buddhist beliefs of the East or the Red Road of Native Americans resolved the scientific questions of our naked awareness? Clearly not, at this point in time. Is nihilistic disbelief a reason to stop searching or the fuel of desire to continue at an ever-deeper level? That would be a self-recursive dead end somewhere in limbo between the Knower and the Known. Can modern man really get by on faith alone, and a promise of “pie in the sky”? I’m certainly not the first to ask from a heartfelt place, nor shall I be the last. I’m not the greatest philosopher and can’t quote them at will, like some grand professor. I’m sure there is much that has been chewed on in that arena that I gnaw again here. But then what seeker doesn’t? In the X-Files, the most prominent item in Mulder’s office was his poster of a UFO with the inscription “The Truth Is Out There” and the retort, “I Want to Believe”. He sought to chase Truth down from the incongruent bits of so-called evidence and reports that came his way, which became his own experiential database, his personal interactions and memories. But how reliable were those perceptions; isn’t truth related to the ability to trust what we know and what we think we know and how we know it? In THE MATRIX, our misperceptions were more overt. These are the great ontological and epistemological questions of philosophy. Can the search for Truth in the universe and in ourselves ever bear fruit? I looked for truth in the self-reflective narcissism of youth and drugs, I looked for truth in spirituality; I looked for truth in magick and the ancient Hermetic arts, I looked for truth in depth psychology and cutting-edge science. I looked for it in the hypnotic wisdom of spiritual Masters. I looked for truth in bleeding-edge art and beauty; I inadvertently sought it in the black hole of conspiracy theory culture. I sought it in spiritual, medical, and technological meditation and self-regulation. I sought it in mentoring from some of the world’s greatest minds, in ruthless self-knowledge, and in my compassionate fellow human beings. I must confess I haven’t found it anywhere, though seeing through to the distortions of each provided the greatest revelations. It may be even more disturbing when mentors suggest you “get it”, even perhaps “better” than they do themselves. Can I badger my own Witness, my own Observer self? The answers I’ve consistently fed myself have often come back up from the extradimensional wormhole of Truth, recycling with each generation of seekers, or in my own as concerns move beyond family and work to the issues of later life. I have found love and compassion present, but generally with blunt self-serving interest as the bottom line, once the niceties are stripped away. They make us feel better, somehow, but isn’t that just psychochemical manipulation in the end, mental masturbation in the name of good will? The humanities describe our condition without illumination. Yet, can we be fully human without the realization of Truth, even about ourselves? Are we stuck with this as the human condition? Truth IS stranger than fiction, as they say. But when I bring it up here I don’t mean what it generally implies that our experience is weirder than anything we can make up, even though it is. I mean that TRUTH, itself, as a concept is perhaps one of the most difficult to define with any degree of satisfaction. In fact, what the pursuit leads to is an infinite continuum of “satisfictions”, reassuring only to those who naively buy into them. The Truth is out there, all right; WAY out there. In our age we’ve been taught through the process of groupthink, generally known as education and corporate media, to trust the veracity of science and the political insights of our leaders. Despite our best efforts at deciphering ourselves and Nature, truth remains a philosophical problem. Personal and collective truth depends on what groups we identify with, and how large and influential they are. Are we more than the sum of the parts of nature and nurture, spiritual propaganda, powerful persuasive rhetoric, cultural memes, and trends? How much Truth does it take for us to overturn our own cherished beliefs and desire to fit in? What do conversion experiences say about our ability to make a philosophical 180-degree turn? Can we ever empathically walk a mile in another’s shoes? The postmodern era reconditioned some of us to “believe” we should reject all metanarrative, and that any existing so-called truths could only be relative; glosses of relative diversities of opinion. Science, looking deeper into the nature of so-called Reality without consensus, has had to relinquish any solid ground for our existence. After about 350 years of the scientific method, it has virtually admitted that it has become a Natural Philosophy once again. Which truth are we supposed to believe about our fragile existence on our rather delicately poised planet? Religious Truth; cultural truth; political truth; scientific truth; conspiratorial truth? Is spiritual truth any better guide to life than humanistic truth? New Age “magical thinking” alleges we create our own reality by the way we perceive and that we can exert a mysterious agent called “intentionality”. It is not without reason we say that the road to hell is paved with “good intentions”. How can we even presume to know what is good for the collective, even presuming we are one holomovement? An intention is the same as a goal; intentionality is goal-directed behavior, a conscious choice of the ego. “Intentionality” is a mystification of the word into a nonlocal holistic goal, a waveform analog of point-directed volition to improve our collective reality, but in many ways is indistinguishable from wishful thinking. Intentionality still implies changing the script in an ordered direction. It may or may not include invoking some forms of divine intervention. But isn’t that arguably another belief with a few missing links in a chain that is called nonlinear to skirt the conundrum? Who among us can distinguish what ‘choices’ are unconscious, preprogrammed or intentional volition. We can blame a seeming match of volition and result with a nonobservable “resonance” or “entrainment”, which may or may not exist. When the environment mirrors our desires, it often doesn’t mean we did it, and to declare it so is often considered a sign of mental illness as in schizophrenic magical thinking. We intuitively have two contradictory gut feelings: we are convinced that we can mentally deliberate to make actual what now only exists in potency as one of many futures and choose the one that really will make a difference in our future lives. But we also know that ultimately, it was based on how comfortable we felt with the choice, an affective consideration hopefully reflecting the truth value of our decision. Even if I form an active intentionality to affect your or my own health at some quantum level and have engaged in intentional development of my extended sensory system, and/or notice certain synchronistic, placebo, or other changes in my own or another’s subsequent state it doesn’t mean I did it, or my intentionality led to healing. It may just be a control-fantasy, a people-helping fantasy, a fantasy of self-declared healing “mastership”, though there are demonstrable psychosocial shamanic effects. Conscious self-care is another matter altogether because self-regulation is definitely possible and stress and immune function can be modulated with diet and lifestyle. Narrative glosses are no reliable sign of an agent’s active control over an event. In fact, it is just as plausible that the belief is an indication of a trance-like mindset or self-induced mind control, motivated by a variety of circumstances, secondary gains, and unconscious dynamics. Internal misinterpretation of self, others and world is a potent for of disinformation, which can be nevertheless validated by cultural viewpoints. Yet, who among us today believes a fakir can defy the laws of gravity climbing up an unsupported rope. You might say “I wouldn’t have seen it if I hadn’t believed it”. In science, it is called observer bias. Any ability to augment or “broadcast intention” could have many more plausible psychosocial mechanisms than mind-over-matter nonlocal perturbation. It isn’t entirely ruled out but is certainly difficult to separate in a non-controlled setting. But what kind of control does the agent have over guidance and and regulatory aspects? When are we able to chose or not between alternate scenarios? Can they be modified in the execution phase? Do results stand up to scrutiny? How can they be distinguished from self-renewal? If we want to believe we will. We will say things like, “What about people who are healed who don’t know they were worked on?” I say this fully aware that experiments by credible M.D.s have been done showing the power of prayer over bacteria, for example. I still don’t feel that those results generalize universally, though some of the results suggest remarkable things. I’m not trying to disabuse you of your belief, but challenge your intellect not to accept “intentionality” as little more than a popular buzzword. As a word it doesn’t explain anything; it has become a knee-jerk response. Maybe “expert” focused human intention has the possibility of creating robust effects on physical reality, and maybe not. It is definitely a popular notion right now with roots in shamanic phenomena and what Jung called it the mana personality. Even the possibility of seeing the Doctor can spike blood pressure in a phenomenon known as “white coat syndrome”. Declaring oneself a “healer” is a way of acquiring personal power and cashing in socially and financially, even in an unconscious well-meaning way on the gullibility of others. It might even short-circuit someone seeking more conventional treatment. But few people other than debunking skeptics are willing to say the emperor has no clothes, though plenty of pseudo-scientific rhetoric has been brought to bear on the subject. Certainly, no one will assert that all “healers” are created equal. The same may hold true for the popular notion of “healing the planet”, which from outside the New Age mindset looks more like a compensatory wishful thinking to counteract the degradation of the environment. Wouldn’t it be potentially more effective to take collective active political and social action instead of driving around in your gas-guzzling SUV dreaming of a better world for your soccer-playing kids? To me it seems like a “confusion of the planes”, like invoking the undines to save a drowning child instead of jumping in for the rescue. Whether it is human impact or due to natural cycles, the temperature keeps warming, the ice is melting, the ocean pump is breaking down, natural and forced extinctions are accelerating, and wishing it away isn’t likely to do anything constructive. Arguably, neither neurology nor consciousness studies has found any indication of so-called “free will”. Positing an extradimensionality just mystifies the whole process again without saying anything definitive. Quantum theory is often cited as the bridge, but this is a functional theory, not a description of ultimate reality. It is just our best current concept that allows us to make predictions and do work. Shouldn’t we really be digging below the onion layer of our own human belief systems to determine why we believe and act from what we believe? We build our identifications, self-image and style around them; what we accept and violently reject. Global wars in the name of religion, with their roots in the Middle Ages and before, bring our beliefs about ourselves and our fellow travelers on Spaceship Earth into question more than ever in that magically eternal moment we call Now. We could dismiss this puerile question of truth as one to mull over in college if it weren’t desolating our planet. We have separated the academic question from everyday life to our degradation. Heavens forbid we should ever learn “the truth”, even about ourselves. We staunchly defend our own self-images in a denial that would make the biggest addictions seem tame. You cannot make a more severe attack on a person than one against the self-image, which will be defended absolutely. Even our best friends have to agree to disagree, to remain silent in their personal dissenting observations. Yet psychology and consciousness studies have failed to turn up this elusive integrated “self” that we defend to the death in some cases. We can display consistent character and self-imposed limitations, but we can also be wildly inconsistent, even in non-adaptive, self-defeating ways. Are we each a house of cards based on no more than a collection of randomly adopted whims and chaotic accidents of upbringing and genetics? In hypnotherapy, we have the concept of subpersonalities, inner figures (inner Judge, Rebel, Child, etc.) with competing agendas that can hijack out lives for their own goals. Likewise, Jungian archetypes, transpersonal dynamics represented in ancient times as gods and goddesses can also effect our notions of Truth. Each form has a different truth, acting like a lens for the mind focusing it on certain thing over others. They influence our “self talk”, persuade you toward ‘their’ view of reality. The basis of the human psyche seems to be a collective of selves--a multimind in a multiverse. Independent and autonomous, they relate with one another mostly unknown to the outer awareness. The extreme form of splintering seen in Multiple Personality Disorder (MPD) simply reflects an extreme form of multiplicity with conflicting perspectives. The "multistate paradigm" of human nature extends toward a psychology and spirituality that is polytheistic, even pantheistic. Fictional virtual realities are constructed by aspects of the self as imaginal conversations. Imaginal dialogues play a central role in our daily lives, existing alongside actual dialogues and interactions. The dialogical self can be seen as a multiplicity of I positions or possible selves, with a decentralized, polyphonic character. This view dissolves the sharp "self-not self" boundary. Attractors work at the edge of chaos to form our existential hologram. Ecological fundamentalism has sought absolute truth in nature, but nature rejects this naivete. The notion of "relativity" implies that there is no absolute truth, therefore, no absolute self. Thus arises the notion of "radical pluralism", which is reflected in our chaotic modern society as exposure to virtually every religious belief, every political view, and a myriad of social values. There is no central belief system in a pluralistic society. The social construction of reality is up for grabs. The whole concept of reality has been called into question by a variety of ideologies and lifestyles. There are widening splits within traditional belief systems. There is transition in human cultural evolution, with the new paradigm in dialogue with the old, seeking a new synthesis. The move is toward a substitution of "story" for Truth, reflecting that sense of movement, change, flow. Perhaps the hallmark of Post-Modern philosophy has been disbelief or skepticism of all "metanarratives." The breakdowns of the story lines of religions, ideologies, even science has led to chaotic social change. We are beginning to realize, individually and as a world-wide culture that "realities" are all human constructions. The task becomes one of "catching ourselves in the act" of creating our own "reality" from the flow of events. Human truth is always an engagement of mind with experience. The sociological message of Chaos Theory is that we don't have to fear the collapse of what we think we are. We don't need to fear the collapse of our personalistic belief system, nor our belief in absolute truth.